Following an eventful first half one would’ve been forgiven for thinking that we were still in the 2014/2015 season.After just 13 seconds, Tuchel’s new-look Dortmund side were trailing and by 22 minutes they were 3 behind the Norweigan team. This was especially a surprise after their dominating performance over Gladbach in their Bundesliga opener on Saturday which featured the large majority of players who were in this Europa League qualifier. Tuchel again organised his side in the 4-2-3-1/4-1-4-1 cross and made 5 changes from the 11 who thrashed Gladbach 4-0 on the weekend. Roman Weidenfeller started as Dortmund’s 1 and put in a less-than-assured performance behind a back four of Schmelzer, Hummels, Ginter and Castro. Bender came in to replace the benched Julian Weigl who put in one of numerous excellent performances for BVB just 4 days prior. Gundogan again started to the right of him whilst Kagawa did too in a higher left position. Mkhitaryan had another great game on the left of the midfield with Kampl sitting on the right in replacement of the rested Marco Reus. Aubameyang led the attacks as a lone striker and later paired with Adrian Ramos. 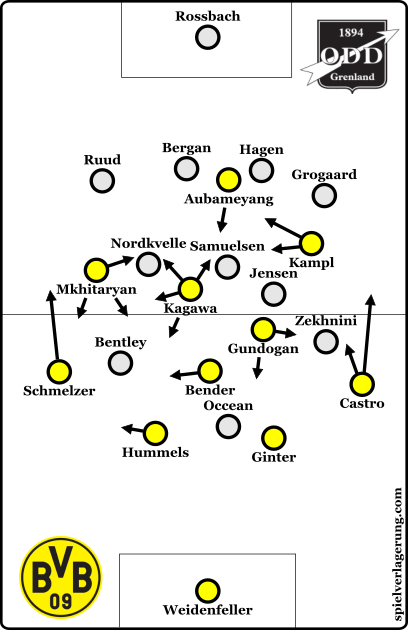 Without the ball, a rather common occurrence for the Norwegian outfit, Odd BK used a man-oriented pressing scheme and generally found quite an advanced position during Dortmund’s building of possession. The scheme was rather strict as the home side’s forwards stuck quite close to the likes of Hummels and Ginter when the ball was deep in Dortmund’s half. As Ernst Happel was once quoted, “if you mark man-to-man, you’re sending out eleven donkeys” and the orientation of Odd BK’s pressing created some issues for the side in defence. Whilst the forwards pressed closely to the Dortmund defenders, the marking in the midfield was much more loose and this resulted in free men being open in the 2nd and 3rd lines of the BVB midfield. Although it is difficult to pinpoint the causation of this issue, it seemed to usually be lapses of concentration by the midfielders due to the distance from the ball. This being aside from the obvious deficiencies in such a pressing system as the scheme is entirely reactive and thus can be easily manipulated by the attackers. The simple fact that the attacker decides the next action and the defender has little ability of predicting this sustainably (unless they happen to be one of Sergio Busquets or Thiago Silva) is a significant problem of its own. 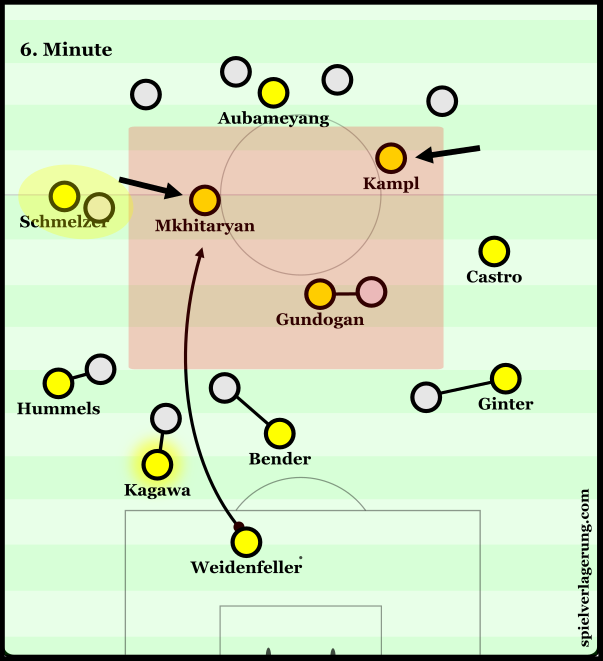 There were also a number of times where the pressing was poorly co-ordinated by the Odd Ballklubb midfield, often seeing multiple defenders commit to the same Dortmund player. In addition to this, they also failed to organise themselves to accommodate the inside movements of both Kampl and Mkhitaryan. The two attacking midfielders where frequently used to move inside which disorganised the pressing of the opposition significantly. Neither full-back would track these movements, preferring to stay in line with the defensive chain and as a result, the two would create the overloads which are so effective against man-marking systems. Despite making some big errors when his goal was threatened, Roman Weidenfeller was also particularly effective in exploiting this lack of co-ordination, especially within the first half where the opposition were more aggressive in their press. On a number of occasions the goalkeeper made some excellent penetrative vertical passes to exploit the press of the opposition by quickly accessing the midfield where the press was poorly coordinated. A prime example of this was in the diagram from the 6th minute below. An image from the 6th minute where Weidenfeller broke Odd BK’s press. In this scene, Kagawa’s dropping movement is quite crucial in making the Odd BK press unorganised. 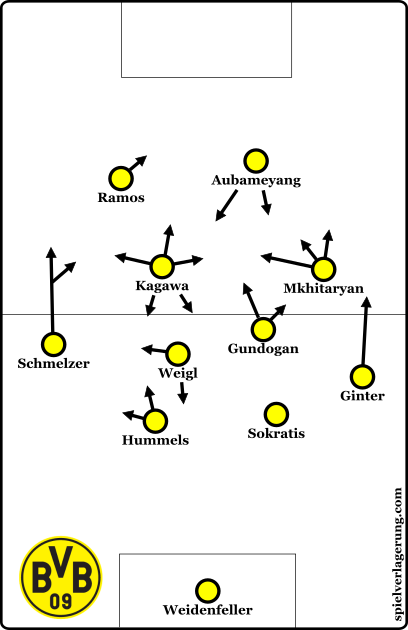 Through dragging the midfielder into the first line along with Schmelzer dragging a midfielder to the wing through his wide positioning, BVB removed any effective central presence from the opposition and thus created access to Mkhitaryan. The man-marking is a clear issue for the opposition as they lack any degree of spatial compactness through their man-to-man tracking of any ball-near Dortmund players. The man-marking also caused issues for Odd BK during Dortmund’s later possession in the opposition half. Due to the wingers both marking the BVB full-backs, Dortmund possessed the ability to force the opposition into a 6 chain across the defence through their own positional structure. Through doing so, the home side’s wide midfielders lost the ability to support the central 3 which then lacks stability, especially in the half-spaces where Kagawa and Mkhitaryan featured throughout. Dortmund forcing the situational back 6. 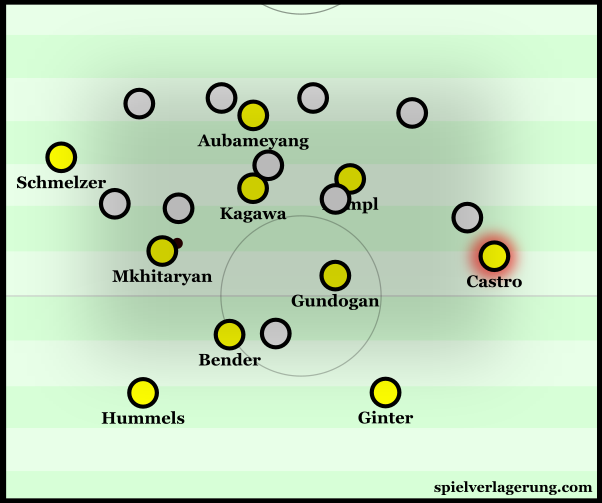 This feature of the game worked well into Dortmund’s favour as it gave them better ability to dominate the centre, emphasizing the abilities of players such as Kagawa, Mkhitaryan and Gundogan who are all key to the possession game. With little support from the 6 defenders which made up the back line of defence, the 3 midfielders were often isolated and prone to overloads from Tuchel’s side, resulting in the likes of Kagawa being completely open in dangerous issues. Tuchel’s attacking strategy took on a few variations from their impressive victory over Gladbach. Against the Foals, Dortmund were quite focused on attacking through the left half-space yet against Odd BK, they were more varied in the spaces they attacked. In their 4-0 win on Saturday, Dortmund generally looked to build down the right and then switch to penetrate the Gladbach block on the left as they were switching. Against Odd Ballklubb however, they were more open to attacking through the spaces on the right also in what was a more flexible approach. Although they did attempt to shift the defensive block to then penetrate on the opposite side, it was somewhat less effective in this match. The opposition’s defensive block was much less ball-oriented than their Gladbach comparison and thus the difference created through switching the ball was less drastic. Due to Kampl’s inside movements there were also some issues when switching the ball from left to right. The situation caused was often not structured well for penetration as Kampl was commonly disconnected from Castro whilst the ex-Leverkusen man individually struggled to exploit any isolation which was created. Possibly as a result of this, Kampl made fewer inside movements later on in the game before his substitution and situationally moved to the wing which could’ve been to exploit the isolations which Castro couldn’t. In response to the 3-1 scoreline come the end of the first half, Tuchel made some changes to the system at the beginning of the final 45 as well as throughout the remainder of the tie. He individually changed the roles of a few players, mainly Mkhitaryan and Kampl. The eventual scorer of the winning goal started to make more inside movements as he formed a bigger partnership with the also-central Kagawa. From this position, Mkhitaryan more directly aided the penetration through the centre of the pitch whilst it offered the potential to create some combination moments with the likes of Kagawa and Gundogan. In contrast, Kevin Kampl became less oriented to the centre and started making more movements within and towards the right side of the pitch. As I mentioned previously this could have been to increase their threat down the right, particularly in isolation whilst it made for a slightly more variable attack from Tuchel’s side. Dortmund’s new shape later in the second half. In the 63rd minute, Dortmund were still trailing at 3-2 and Tuchel made a more drastic change to the system by replacing Kampl with Adrian Ramos. This led to a new shape which was generally a cross between a 4-4-2 and more a 4-2-2-2 as Mkhitaryan had more of a clear inside role with Kagawa. Throughout last season, Dortmund quite commonly would resort to a 4-4-2 shape when trailing in games and their possession game would suffer drastically. In this case they were nowhere near as poor with the ball, the change being primarily due to the interiors in Kagawa and Mkhitaryan whose presence meant penetration into the centre possible – one of the many issues from last season. Although the structure and orientations are clearly not the same when compared to the 4-4-2 of 2014/2015, this system was much more dynamic with better connections through the centre and suggests a much better in-game variation for Tuchel’s side. There were some variations within the movements of both Kagawa and Mkhitaryan would both situationally move into a wider position. A prime example being the winning goal where the Japanese midfielder crossed to Mkhitaryan from a wide-left position. For the most part though both were central and in moments combined well in accordance with the vertical movements of Gundogan. Schmelzer was also key as he carried on in his aggressive role at left-back. 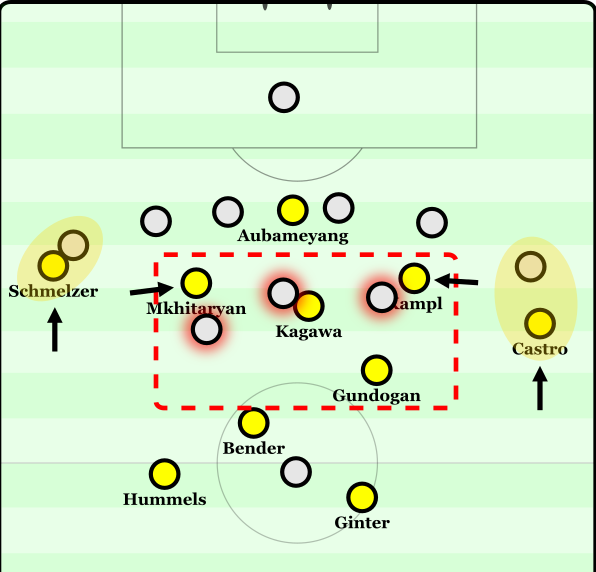 With Mkhitaryan on the opposite wing and Kagawa staying more central, Schmelzer’s individual occupation of the left wing was key and made good support for the central presence of BVB. Dortmund’s third match in the Europa League was as crazy as some of the matches from last season containing similar mistakes at the back. However the side has to be credited as they reacted to such issues in a much better fashion, staying composed and not resorting to deep crosses into Ramos – something which saw them succumb to defeats last campaign with little comeback on display.